The quality of British precious metal is protected by law and precious metals have been hallmarked in this country for over 700 years. In the UK, it is illegal to describe a piece for sale as “silver”, “gold” etc., unless its quality has been tested by an Assay Office and it bears a hallmark consisting of the maker’s mark, the fineness mark (925 for Sterling silver) and the mark of the certifying Assay Office e.g. the anchor for Birmingham. Sometimes a traditional fineness mark e.g. the lion for Sterling silver and a date letter are also added but these are not compulsory. In the absence of a hallmark, the description must say white or yellow metal if the piece weighs over 7.78g. For items under the 7.78g legal limit, jewellers often stamp with their own maker’s mark and fineness mark, thus taking responsibility for guaranteeing the quality of the metal they have used. Some textured pieces are difficult to stamp without a laser so small pieces may not be marked by the maker in all cases. 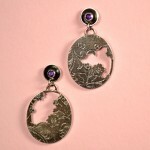 Sterling Silver is an alloy (mix) of 92.5% pure silver and 7.5% other eleme nts (mostly copper). This has been the alloy of choice for silver jewellers for centuries. The reason for alloying silver is because the pure metal – also known as ‘Fine Silver’ or 999 Silver – is very soft and not hard-wearing enough for making fine jewellery. Fine silver is mostly used only for the bezels used to set stones, as it is soft enough to be easily pushed over the stone to hold it in place. Alloying with copper adds strength while preserving the beauty of the precious metal. Sterling silver is often referred to as ‘925 silver’ being 925 parts per thousand silver, and the 925 mark appears on the Sterling silver hallmark. rose garden. silver, peridot . When you have just bought a lovely piece of silver jewellery, it is important to know how to look after it to keep it looking its best. Beautiful jewellery can become a family heirloom and be cherished through the generations of your family. 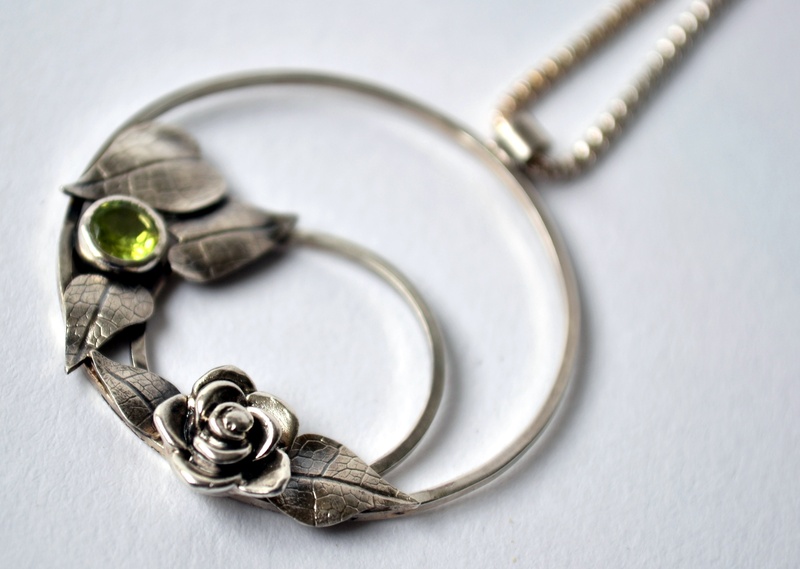 Sterling silver is a metal that reacts with air, causing it slowly turn a yellow and then grey colour. This process can be slowed down by keeping the piece in a small ziplock bag when not being worn to exclude the air thus slowing down the reaction. Alternatively, just keep it in the box it arrived in. This will also help stop your piece from getting scratched which would happen if it was jostling with the other items in your jewellery box. When you need to clean your jewellery, the method used will depend on its finish but it’s best not to wait until it is really tarnished. If it is a shiny polished piece, you can use an impregnated silver cloth to gently rub away any light tarnish and bring up the shine again. If the piece is textured, a silver cloth might not get down into the crevices and if the piece is patinated/oxidised (a grey colour in the deep relief of a textured pattern) then using a silver cloth might remove the added patina. In these cases it is best to use a soft toothbrush and a little liquid soap, brushing gently under running water to remove tarnish. You could dry it and then use a silver cloth to shine the highlights. Another product that you might find useful is Silver Foam which is applied with a wet sponge and rubbed to a foam on your piece and then rinsed off. This is a good way to clean detailed or delicate pieces but do not use this on patinated/oxidised silver as it will destroy the grey finish. Jewellery can of course be cleaned in an ultrasonic cleaner but be careful. Diamonds and the harder gemstones like rubies and sapphires are fine. Some gemstones such as opals, and also those with inclusions (imperfections inside the gem) such as emeralds can be damaged by the ultrasonic waves. Don’t use this method for cleaning pearls which would certainly be damaged. If in doubt, leave it out! Pearls need special care. They should be protected from cosmetics and perfumes. After you have worn pearls, particularly necklaces and bracelets that have been next to your skin, they should be wiped with a dry cloth before storing in a soft bag or padded box away from sunlight. The oils from your skin and strong ultraviolet light can cause them to yellow over time. If all this fails and you have a piece of Annie Coombs jewellery that has become very tarnished, I am more than happy to clean it and check the setting for you for the cost of postage so please do not hesitate to get in touch. I hope you enjoy wearing your jewellery and that it gives you a lifetime’s worth of pleasure.